Fit Fluential Mom: 5 Recipes Using Cornflakes! 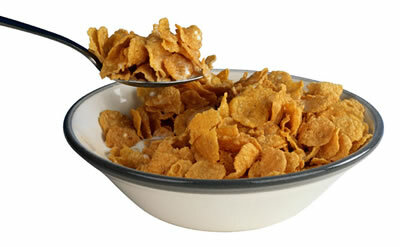 Believe it or not, there is lots you can do with the corn flakes your kids eat every day for breakfast! Incorporate them into dinners, snacks, desserts & more. Try any of the recipes below and see what your family thinks! Preheat oven to 450. Place wire rack in large jelly roll pan. In pie plate, crush 3 cups cornflakes, with 1 Tbsp honey, ½ tsp finely grated lemon peel, ½ tsp salt and ¼ tsp pepper until blended. Coat 1 lb chicken tenders or breast with 1 Tbsp Dijon mustard. Dredge each in cornflake mixture. Place on rack. Bake 12 minutes or until chicken is no longer pink in the center. Serves 4. Double or triple recipe for larger families. In large glass bowl, microwave 2 cups semi sweet chocolate chips and ¼ cup peanut butter on high for 30 seconds. Stir and repeat until melted. Mix in 2 cups of cornflakes, ½ crushed potato chips & ½ cup unsalted peanuts. Drop by tablespoonfuls onto cookie sheet lined with wax paper. Refrigerate until hard. Makes 3-4 dozen. In 12 inch skillet, heat 1 inch water to boiling on high. Add 1 lb broccoli florets. Cook 3 minutes or until tender. Drain and sprinkle with 1/8 tsp salt. In skillet, melt 2 Tbsp of butter on medium. Add 1 cup of cornflakes and cook 2 minutes while stirring. Add 1 tsp grated lemon peel and 1/8 tsp pepper. Sprinkle over broccoli. Serves 4. Preheat oven to 400 f. Cut & peel 3 lbs apples and pears into ½ inch chunks. In buttered 13 by 9 inch baking dish, toss apples, pears, ¼ cup packed brown sugar, ½ tsp apple pie spice and ¼ tsp salt. In a bowl, crush 3 ½ cups of cornflakes with 5 Tbsp butter, 1/3 cups of brown sugar and ½ tsp of apple pie spice until blended. Sprinkle over fruit. Bake 30 to 35 minutes or until golden brown. Serves 8.